Definition: Concrete sprayed onto a steel framework which can be worked into any shape, depth or size desired. Gunite gives us the ability to build raised walls, waterfalls, spillover spas and other water features. The Facts: Gunite pools are the most elaborate of the pool categories. These are permanent, reinforced pools with concrete and plaster instead of liners. Excavation is necessary, and a variety of creative options are available to complement these high-quality pools, including waterfalls, custom steps and tanning shelves. The high quality of these pools usually puts them in the highest price range. Can take longer to build than other kinds of pools due to the fact that it is being built in your backyard rather than a factory and we are subject to weather conditions. Like the paint finish on your house, your pool finish will need resurfacing over time, typically 7-15 years, depending on the finish. Add a touch of class to your swimming pool area by incorporating Designer Collecton pavers into your design. Create a look that is as unique as you are by picking colors and textures to match your tastes. 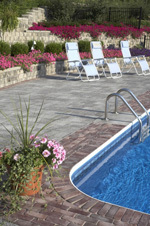 Beninati Pools uses Unilock pavers to create the look you have been dreaming about.